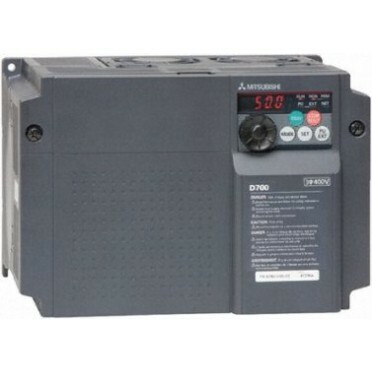 D740 Series AC Frequency Inverter for 400V 3 Ph motor in VxF or Vector control to 5A. Simple to set-up for speed control of a standard three phase AC Induction motor. Features - Front Mounted Potentiometer, 2 x Analogue Inputs, 5 Digital Inputs, 1 Analogue output, 1 Relay Contact set and 1 digital output. Programmable from a pc via FR-Configurator software (V30010-E), or from the 10 key hand-held parameter unit (see Linked Products below). EMC Filters - None. See linked products below for external footprint EMC Filter Module. products in the Mitsubishi 'Micro' family including the FX3U PLC and GT1020 operator interfaces .